The tower and north arcade are late C12, the south aisle is C13 and the rest is C14, except the C15 north chapel and east end. The Dacre monument, C16 in its present form, is between them. 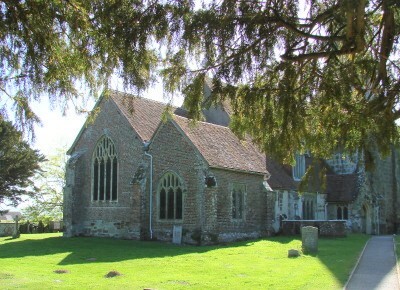 Herstmonceux church is almost two miles south of the present village, near the castle. It marks the site of the mediaeval village, but the date when this was moved is not certain. In 1441 Roger Fenys (or Fiennes), the builder of the castle, received permission to empark 600 acres (SAC 111 (1973) p69), and that may have been the occasion. Nothing reveals the nature of the church here by 1086 when it is mentioned in Domesday Book (9,5), except, possibly, the relatively short dimensions of the nave, though its rendered west wall is more likely to be late C12, like the tower and north aisle. The tower stands at the north west corner, and, unusually for the date, is built of sandstone ashlar, with massive clasping buttresses like Peasmarsh and Westfield; the north east one turns into a polygonal stair-turret. Above square-headed north and west openings are three pointed recesses, the centre ones open as bell-openings. 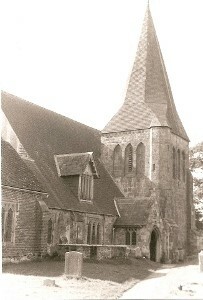 This is similar to Northiam, where the tower has been heightened later; here, there is a shingled broach spire. 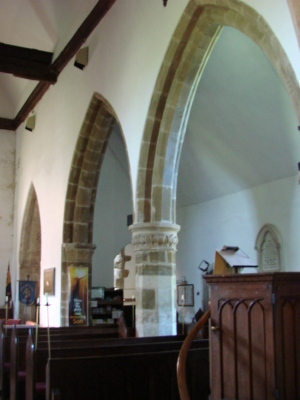 The arch from the tower into the nave, with a double-chamfered head, semi-octagonal responds and moulded capitals, is smaller than the two-bay north arcade, which has more steeply pointed heads. The pier and responds resemble the tower arch, but the capitals have heavy leaf carving, as at Battle. The arch into the aisle from the tower is also smaller with a chamfered head, plain abaci and square responds. Above it is the late C12 roofline. The south arcade of about 1220 has three full bays and shares the proportions of the north arcade. Its octagonal piers perhaps also imitate this, as round piers were then more common. The upper parts of the capitals have stiff leaf, finely carved in Caen stone. The walls may be of this date, but there is no detail. C14 remodelling was extensive, including the chancel and chancel arch, the latter of which has semi-octagonal responds on high bases. It is heavily, but probably accurately, restored. The renewed square-headed south window has pierced spandrels and there was another, now blocked and concealed by the render (VCH 9 p135). A moulded north doorway now opening into the C15 chapel may formerly have led into the open; though one reset C14 chapel window, may indicate a predecessor, as may the lean-to linking chapel and north aisle, with a similar window; it would have been of little use otherwise. Both aisles were heightened, with side windows as the others. Some roof timbers look original, but are plastered; the nave roof dates from this time or a little later. There are moulded north and south doorways, the latter in a stone porch with a double-chamfered arch. Finally, the west end was altered, with a doorway with curling stops on the label and a window, which though now C19, is in an old opening. The north chapel, whether or not it had a predecessor, dates from around 1440 and it has been suggested (1 p140) that the apparently C16 tomb in an opening between chapel and chancel (see below) is probably developed from that of Roger Fiennes (d1449) for whom the chapel was built. This is plausible, since the bricks of which it is constructed are not otherwise found in Sussex churches at this date but closely resemble those used in the castle (ibid p136), which was then near completion. The east wall of the chancel was also then rebuilt in brick, except for a stone plinth, which could be earlier. The external detail has been replaced. After the Reformation the windows were replaced by domestic type ones at the west end of the nave and south aisle, as the Sharpe Collection drawing (1797) shows; the outline of the latter remains. The east window had a square head (3 p189) and was probably similar. A timber north porch was added in the C18 (VCH ibid). No names connected with C19 work are known and it was probably done piecemeal. This could explain the retention of the plastered aisle roofs and the blocked windows. The four-light east window with panelled tracery was new in 1851 (3 ibid) and the side-windows, the boarded roof and the chancel arch may have been restored at the same time. The other date known is 1874, when the north porch was rebuilt (VCH ibid). 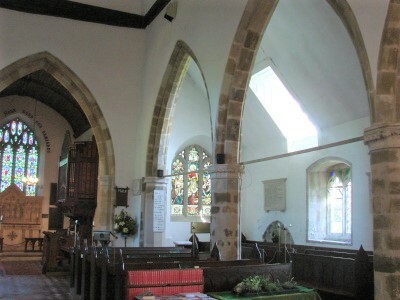 The nave may have been restored then, with repairs to the stonework and a new west window. The dormers in both aisles would be unusual at this time and Meads considered them C17, but there is no sign of work older than the C19, though there could have been predecessors to light galleries. Brass: (Chancel floor) Sir William Fiennes (d1402) Canopied with a Norman-French inscription, a late example. The austere effigy is almost devoid of expression. The brass belongs to Series B (see London workshops), with lettering that shows similarities with that on the tomb of Richard II at Westminster (Badham: Cast Effigies p116). 1. C14 square bowl with four octagonal shafts at the corners, as at Alfriston. 2. (Fragmentary) Possibly C14 square bowl with shallow trefoiled panels and tracery. (NB. Some glass was damaged by a bomb in 1944). 1. (North chapel, east window top – see below for main lights) Fragments of C15 yellow and white glass, including two symbols of the evangelists. 2. (East window) J Powell and Sons, c1855 with the small medallions the firm favoured during its earliest period (Cash book). 3. 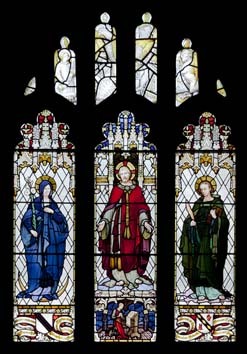 (South aisle, east window) (I A) Gibbs and Howard, 1880 (B 39 (1880) p681). 4. (South chancel) W B Simpson and Sons, designed by W Glasby, 1913 (DSGW 1930). 5. (North chapel, east window) A L Ward, 1930 (WSRO Fac 1716). The figures show little change from work of fifty years earlier, but the setting, largely of clear glass, is more characteristic of the actual date. 1. (Recess in south aisle) Low and C14, with a cusped head and a shield on the back, which formerly bore the Monceux arms (Mosse p103). The adjacent moulded capital is likely to come from it, so it may not be in its original state. 2. (Between chapel and chancel) Thomas, Lord Dacre (d1533) and his son, also Thomas (who died first in 1528). It is one of the finest of its date in Sussex and a repainting in 1969-70, though rather gaudy to modern eyes, is probably accurate (see 1 throughout for a description of the work by the master mason involved). 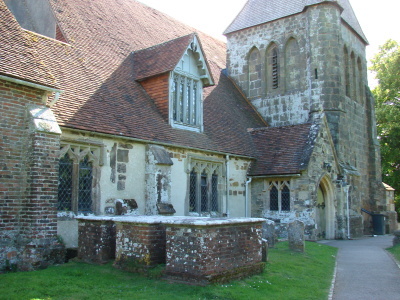 Unlike contemporary work at Broadwater and Boxgrove (both West Sussex), there is no Renaissance detail and it is possible that the chest with large cusped quatrefoils bearing shields was adapted from a monument of about 1450, perhaps present here since the chapel was built. The armoured effigies have been dated to c1480 (VCH ibid), and even before this Ray was the first to propose that they had been transferred from Battle abbey (2 p55) after the dissolution. 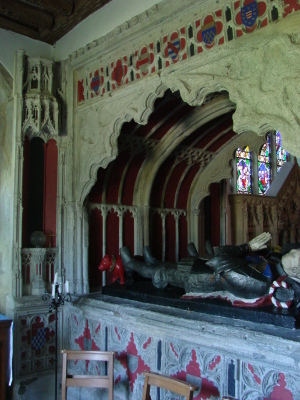 On the basis of the heraldry he argued that they came from the tomb there of Thomas, Lord Hoo (d1455) and his half-brother, yet another Thomas (d1486); their family was linked to the Dacres. It appears that the canopy probably shares this origin, for the deep, crested cornice with draped shields and crests, shows signs of having been cut down (1 p135) and is of the same Caen stone as the effigies. Its cusped and sub-cusped arch, above a band of quatrefoils, has traceried spandrels and a panelled soffit. Elliott (1 p138) suggests that only the associated niches date from the 1530s and thus from the time when the monument was set up here. 3. (North chancel) Georgina Hare Naylor (d1806) by M Kessels (Roscoe p691). This shows her on her death bed above the description and was the second version to be made, the first having been lost at sea. 4. 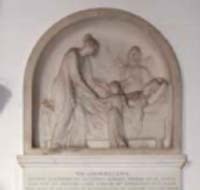 (North chancel) Francis Hare Naylor (d1815) Husband of the last, his memorial is a plain inscription by L Parsons (signed). 5. 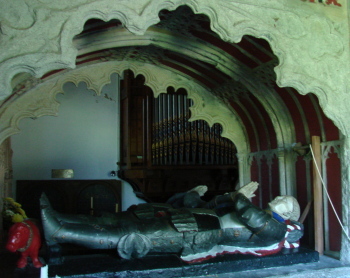 (Nave) 1st Lord Hailsham (d1950), formerly Lord Chancellor. Restrained tablet. 6. (Churchyard) Various headstones and tombchests with terra cotta plaques by J Harmer. 1. (North chapel) Small with an ogee-head and thus C14. 2. (North chancel) Trefoiled niche, probably C14. 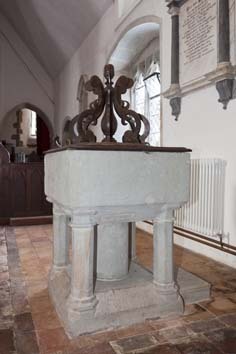 It is too shallow for a stoup and it has been suggested that it was linked to an Easter sepulchre (2 p32), now gone. 3. (East walls of chancel and chapel) Large and canopied, intended for statues. Probably contemporary with the Dacre tomb. Pews and pulpit: Most probably dating from 1851 since the pews, though low, still have doors and the pulpit has arcaded panels. 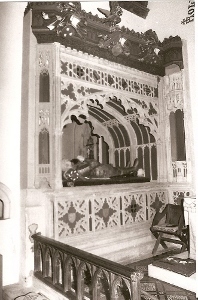 Reredos: Stone and centred on the Crucifixion, presented in 1893. 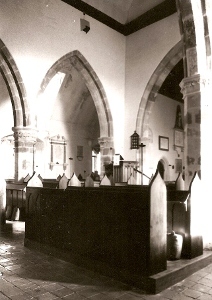 Screen: (In entry from north aisle to chapel) Restored C15, with original uprights. It is now glazed. Squints: Two steeply angled ones between the chapel and the chancel. My thanks to Nick Wiseman for the photographs of the font, glass and the Kessels monument.